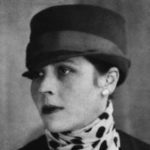 Djuna Barnes was an American writer and artist best known for her novel Night wood (1936), a cult classic of lesbian fiction and an important work of modernist literature. In 1913, Barnes began her career as a freelance journalist and illustrator for the Brooklyn Daily Eagle. By early 1914, Barnes was a highly sought feature reporter, interviewer, and illustrator whose work appeared in the city’s leading newspapers and periodicals.